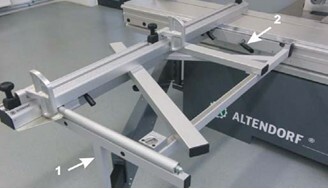 The cross-slide must be attached to every point of the outer-lying round bar of the sliding table, and must be clamped. Place the supporting pipe (1) of the cross-slide on the telescopic tube's bolt. Swing the cross-slide to the sliding table, attach it and clamp it with an eccentric lever (2). Place the crosscut fence on the cross-slide so that the centring bolts enter the hole or groove. Raise the clamping lever (1+2) and press it outward. Lightly press the clamping lever (1+2) down (for clamping). Raise the clamping lever (1+2) and press it inward (for release). Place the crosscut fence in a new position, making sure that the centring bolts enter the hole/groove.